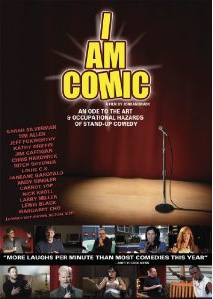 Here is part II with Jordan Brady, stand-up comic, and director of the new documentary on stand-up, I Am Comic. While this podcast was recorded at the same time as part I (which you can find here) and it’s not required to listen to it to understand part II. You’ll probably be confused though, so I still recommend it, especially if you want to know about the minutia on films you’ve never seen like Jordan’s films The Third Wheel, American Girl, Dill Scallion, and Waking Up in Reno. Anyway, this podcast deals with why Jordan secretly thinks I’m a big fan of I Am Comic, the wondrous film career of Pink Lady and Jeff star Jeff Altman, what exactly is the stand-up comedy version of AA, how a machine can detect the success of stand-up comedy, and why the film The Aristocrats is actually just a big joke on the audience. And there’s a bonus at the very end, so don’t turn it off right away. This entry was posted on Thursday, July 29th, 2010 at 3:14 am	and is filed under Documentary. You can follow any responses to this entry through the RSS 2.0 feed. You can leave a response, or trackback from your own site.